The Ag Economy Barometer rebounded in August to a reading of 129 after falling to 117 in July. Although the producer sentiment index increased by 12 points in August, producer sentiment remains well below its late spring readings of 141 in May and 143 in June. The shift in producer sentiment occurred primarily because producer’s perception of current conditions improved as the Index of Current Conditions increased to a reading of 121 following a dip to 99 in July. The Index of Future Expectations also rose in August but the increase was modest, rising to 132 just 6 points above its July reading. Figure 1. Purdue/CME Group Ag Economy Barometer, October 2015-August 2018. Figure 2. Indices of Current Conditions and Future Expectations, October 2015-August 2018. Producers shifting perspective on the U.S. ag economy was also evident in their response to a question about making large investments in their farming operation. In August, 26 percent of respondents said now is a good time to make large investments, up from 20 percent in July and unchanged from their response to this question back in June. Correspondingly, the percentage of producers that felt now is a bad time to make large investments fell by 8 points to 65 percent in August compared to 73 percent in July. Figure 3. 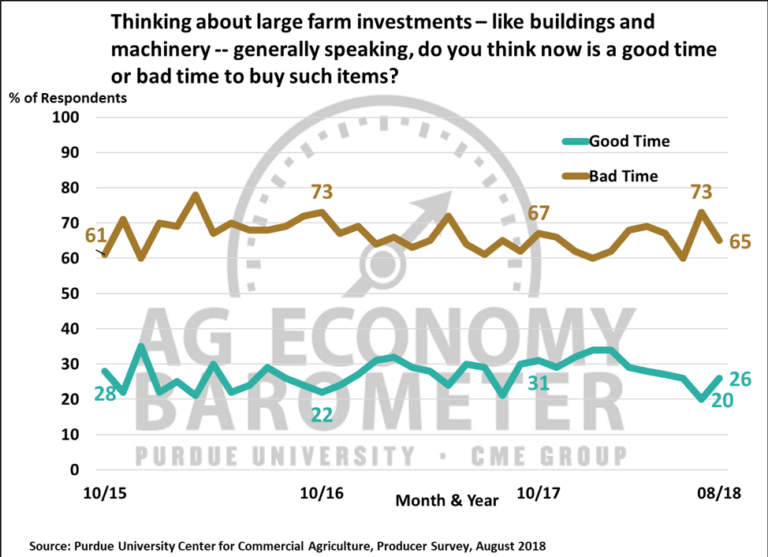 Thinking About large farm investments, like buildings and machinery, generally speaking, do you think now is a good time or bad time to buy such items?, October 2015-August 2018. After jumping 10 points in July, the percentage of producers expecting lower farmland values in the upcoming year improved slightly to 29 vs. 31 percent a month earlier. At the same time, the percentage of producers expecting higher farmland prices declined to 14 from 15 percent. When asked for their perspective about farmland values 5 years from now, the percentage of producers expecting higher prices declined from 47 percent in July to 42 percent in August. However, the percentage of respondents expecting lower prices also declined, falling 3 points to 14 percent. The percentage of producers that feel trade conflicts will reduce their farm’s net income, 71 percent, was virtually unchanged in August from July. However, among those expecting an income loss the percentage income reduction they think likely shifted from July to August. In July, 35 percent of respondents expecting an income decline said they believed an income reduction of more than 20 percent was likely. In August, that percentage fell to 26 percent of respondents. Combining the percentage of respondents expecting 1) an income decline of up 10 percent and 2) those expecting a reduction of 10 to 20 percent indicates that, overall, producers’ concern about a trade conflict related income decline moderated from July to August. In July, 65 percent of respondents that expect an income decline thought the income loss would range up to 20 percent. In August, 74 percent of those expecting an income decline put it in the range of 0 to 20 percent, indicating that producers previously expecting an income decline of more than 20 percent had scaled that back somewhat. Soybeans are the single commodity hit hardest by China’s imposition of import tariffs. To learn more about how this is impacting U.S. producers we asked survey respondents if they planted soybeans in 2018 and, if they answered yes, we asked them what percentage of their anticipated 2018 production they priced prior to June 1, 2018. June 1 was chosen because November soybean futures reached their spring peak in late May and then declined sharply during June as the trade conflict unfolded and as 2018 yield prospects improved. Nearly two-thirds (64 percent) of this month’s survey respondents said they planted soybeans this year. 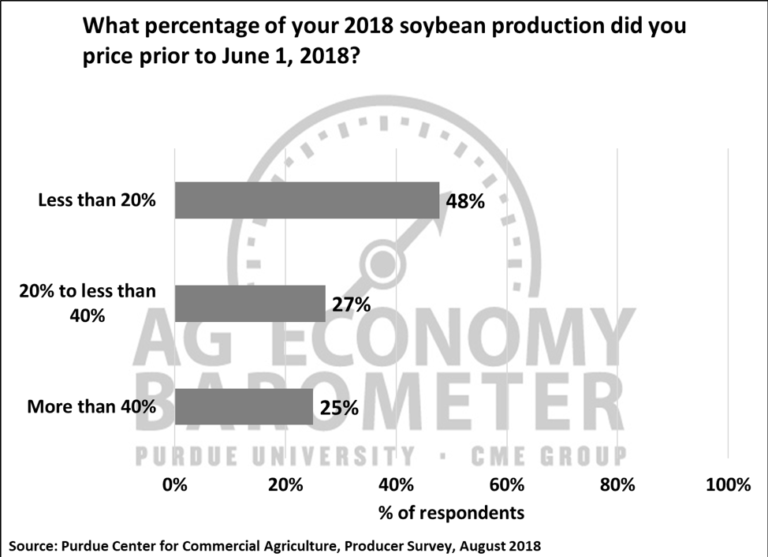 However, not all respondents that planted soybeans in 2018 were willing or able to estimate how much of their crop was priced prior to June 1 as 11 percent of respondents chose not to respond to the pricing question. However, among those that did respond, 25 percent of them said they priced more than 40 percent of their 2018 crop prior to June 1 and 27 percent said they priced 20 to less than 40 percent of their 2018 soybean crop. Nearly half (48 percent) of respondents said they priced less than 20 percent of their anticipated 2018 soybean production. Figure 4. What percentage of your 2018 soybean production did you price prior to June 1, 2018?, August 2018. 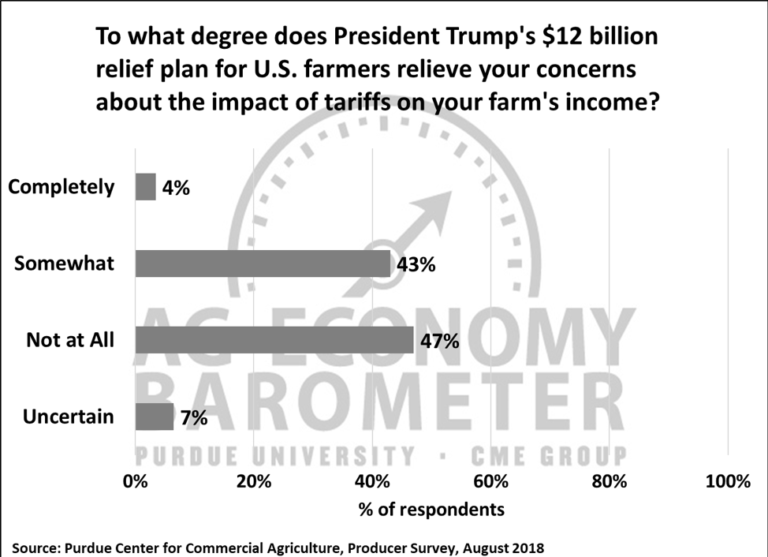 Finally, to gain a better understanding of producers’ perception regarding the administration’s relief package we asked producers “To what degree does President Trump’s $12 billion relief plan for U.S. farmers relieve your concerns about the impact of tariffs on your farm’s income?” Choices provided to respondents were 1) Completely, 2) Somewhat, 3) Not at all, and 4) Uncertain. The most common response was “Not at all” chosen by 47 percent of respondents, followed by “Somewhat”, chosen by 43 percent of respondents. Just 4 percent of respondents chose “Completely” and 7 percent of respondents said they were “Uncertain”. Figure 5. To what degree does President Trump’s $12 billion relief plan for U.S. farmers relieve your concerns about the impact of tariffs on your farm’s income?, August 2018. 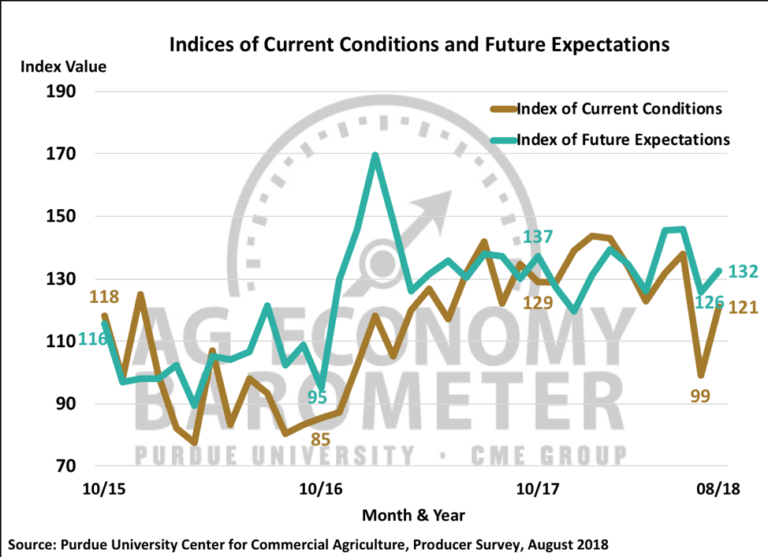 The Ag Economy Barometer rebounded in August to a reading of 129 after falling to 117 in July, but remained well below Barometer readings in May and June. The sentiment shift was primarily attributable to producers’ improved perception of current conditions. 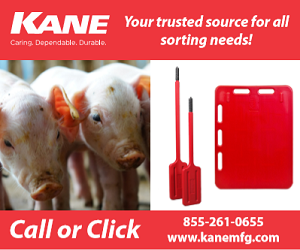 Producers were also less pessimistic about the direction of the U.S. ag economy in the year ahead in August than they were in July and this seemed to spill over into a somewhat more optimistic view about making large farm investments. Producers were still concerned that trade conflicts will lower their farm income, but scaled back their perception regarding the magnitude of the expected income reduction compared to responses received in July. Finally, producers’ opinions were evenly split regarding whether or not the administration’s $12 billion relief plan will relieve their concerns about the impact of tariffs on their farms’ income. Nearly half of respondents (47 percent) said the relief plan would either completely (4 percent) or somewhat (43 percent) relieve their concern, however 47 percent of respondents said “not at all” in response to this question.